Home / Articles / 2018 / What Do Consumers Think of GMOs? We partnered with Hartman Group on research that delved into consumer perceptions of genetically modified foods; about half (is that good or bad?) will avoid them. When it comes to genetically modified organisms in food, two conclusions can be drawn: There’s a segment of the public that’s receptive to arguments for the use of GMOs … but the GMO labeling regulations under consideration by USDA may make that group shrink. Twenty-four years have passed since FDA approved the first GMO food — or bioengineered food, as the USDA would have it — but GMOs are relatively new to public discourse. As recently as 2010, a quarter of the public told researchers at the Hartman Group they had never heard of GMOs. Today, only cave dwellers without social media accounts say the same, and half of the rest don’t like what they’re hearing. Organic and Natural 2018 is a biennial research study by Hartman Group (www.hartman-group.com), and the Bellevue, Wash., research firm gave Food Processing exclusive use of its considerable section on GMOs. Respondents, all consumers, expressed near-unanimous (97 percent) awareness of GMOs, although many were sketchy on the details. Almost half indicated they avoid buying products with GMOs, while a quarter of those shoppers frankly admitted they don’t know enough about them. A third want to withhold support of companies that use GMOs in their formulations. More troubling for mainstream products with GMO ingredients is how shoppers are voting with their pocketbooks. Consumers told Hartman researchers conventional food and beverage products constitute 54 percent of their grocery purchases, down from 65 percent two years earlier. More than a third of buyers of organic and natural products cited avoidance of GMO products as a motivating factor. Those sentiments are supported by the meteoric rise in non-GMO certified products, from a baseline of $348.8 million in 2010 to $26 billion today, according to the Non-GMO Project. Despite an eight-year head start, certified organic sales now trail those certified as non-GMO in many categories. What people say and what they do are not necessarily the same; nonetheless, the swelling ranks of people who say they avoid buying GMO foods are cause for mild panic. When Hartman asked 11 years ago, only 15 percent said they avoid them. The proportion has increased in every subsequent survey, tripling to 46 percent. People want to know where their food comes from and what’s in it, and that includes GMO ingredients. Congress responded to that demand in 2016 with GMO labeling legislation, although in no small part because food companies wanted to pre-empt a patchwork of state labeling laws. USDA, not FDA, was charged with writing the specific regulation, and the agency's Agricultural Marketing Service just opened a 60-day comment period on what it proposes (the comment period ends July 3). The early reviews are in: People hate them. That doesn’t bode well for the trust-building and frank discussions that many insist are needed if avoidance of GMO foods isn’t going to mushroom. Two-thirds in Hartman’s survey believe GMO labeling should be mandatory, and two in five say they would be more likely to buy products that contained them if a food company was up front about explaining why they use them. If that isn’t an endorsement for greater transparency, what is? At this point in the review, USDA offers three approaches. Food and beverage companies can refer to the product as a “bioengineered food,” “contains a bioengineered food ingredient,” or something along those lines. Alternatively, one of three symbols can appear on the label. One resembles a smiley face, another is a smiling sun with the letters “be” as eyes, and the third is an uppercase “BE” on what may or may not be the branch of a tree. Critics say the smiley face and sunshine whitewash this controversial issue. The final option is a QR code with accompanying text to the effect of “scan icon for more information.” This should delight the Grocery Manufacturers Assn. After pouring millions into campaigns against state-by-state referendums on labeling, GMA launched its SmartLabel initiative, a voluntary labeling program. GMA claims 25,000 products now carry a SmartLabel QR code, but it’s questionable if individuals seeking information about GMOs would choose the website of a company selling products with GMO ingredients over social media or other sources. A major point of contention in USDA’s solution, however, is the lax definition of what constitutes a genetically modified product. USDA sets the bar at 5 percent of composition. The Non-GMO Project, on the other hand, defines non-GMO as less than 0.9 percent, a level consistent with limits established by the European Union, Russia and China. What most incenses labeling advocates, however, is USDA’s exclusion of some uses of GMO crops. The department takes the position that refined oils and sweeteners used in formulations are exempt from labeling. More than 90 percent of the U.S. crops of corn, soybeans, canola and sugar beets are grown from GMO seeds. Product formulations that use those sweeteners and oils would not be labeled. USDA’s reasoning is that the DNA in GMO grain is destroyed during processing. Additionally, the department ruled that GMO grain that goes to livestock feed or pet food is exempt because the labeling amendment to the Food, Drug and Cosmetics Act applies only to food intended for human consumption. Concern about the impact of GMO ingredients on human health tops the list of reasons Hartman survey respondents gave for avoiding or reducing intakes of foods containing them. Many within the food industry view this concern with scorn, citing a litany of chemical analyses that have concluded there is no discernable difference between genetically engineered and conventional foodstuffs. Unfortunately, science cannot prove a negative, making it impossible for any science-based evaluation to conclude that there will be no long-term repercussions from GMO consumption. More to the point, science’s imprimatur doesn’t carry the weight it once did. Better than a third of the public believes scientists have little or no understanding of the issue. Consider the parallel with climate science. While the safety of GMOs enjoys 88 percent consensus in the scientific community, 98 percent of climate scientists agree that global warming is real and a consequence of human activity. Yet a large swath of the population doubts the reality of climate change, a position that has attained the status of public policy with the support of one of the two major political parties. Disinformation campaigns by carbon-based businesses were instrumental in sowing doubt and hardening positions on climate change. What possibility would a food industry effort based on science have in persuading GMO doubters that genetic engineering is perfectly safe? In any case, arguments against GMOs have expanded to include issues beyond the competency of science. Concerns about the environmental impact of GMO crops were cited by a third of the Hartman sample as reasons for avoiding or reducing GMO consumption. The loss of biodiversity is part of that, and a recent study that linked GMO crops with increased pesticide use has been seized by opponents as further evidence of environmental harm. Perhaps the biggest obstacle to winning public acceptance, however, is the failure to answer the WIIFI question: What’s in it for me? Farmers are the primary beneficiaries of higher yields from planting GMO seed, and it’s a pretty good business model for suppliers like DuPont and Monsanto. But higher yields of commodity crops doesn’t lower the cost of retail products. If there is any possibility of risk, a shopper might ask, what is my reward for buying those products? The argument that GMO crops are needed to feed a growing world population rings hollow to many. World hunger is more closely linked to poverty than an inadequate food supply. People go hungry because they don’t have money for food, not because there is nothing to buy. In the minds of many, GMOs have more to do with business profitability than an opportunity for public altruism. Survey data present a black and white view of awareness and attitudes. In one-on-one interviews, people present more nuanced views, observes Hartman Group’s Mellissa Abbott. Distrust of GMOs is bound up with issues like animal welfare, antibiotics use and worker welfare. It is of a piece with opposition to Big Ag, Big Food and a preference for fresh new firms that tout their differences to the status quo. In fact, products certified by the Non-GMO Project may be the poor man’s version of USDA certified Organic. Shoppers who told Hartman they trust the Non-GMO Project seal only lags those who trust USDA certification by a few ticks, 51 percent to 55 percent. Moreover, Hartman respondents ranked a lack of GMO ingredients as a more important purchase decision (40 percent) than the presence of the USDA Organic seal (32 percent). The primary reason people give for not buying organic products is price. Part of the price premium reflects the cost of meeting stringent organic standards. Non-GMO products, on the other hand, may add little or no additional cost to a product. If those products are perceived as healthier than mainstream alternatives, a modest upcharge needn’t be a barrier to purchase. For years, Hartman consultants have encouraged companies to engage in discussions about GMOs and to be upfront about their use -- to be transparent, in the current vernacular. That’s not the same as advocating for GMOs; a food company can only build goodwill and gain a measure of trust if it is upfront and prepared to deliver what consumers want to buy, not what its suppliers want to sell. Some major food companies have broken ranks to do just that. The resulting schism with their peers is apparent, given the many defections in GMA membership. Some of those who remain prefer to keep a low profile rather than engage in a dialogue they perceive as a no-win situation. Some believe consumer opposition is soft and agribusiness and food processors can drive the discussion about GMOs. In reality, they would just be additional voices, should they choose to engage. Many companies already have started labeling their products with the simple statement "Partially produced with genetic engineering." The type usually is just below the ingredients list or Nutrition Facts panel and in about the same size and font as warnings "contains wheat and milk; may contain soy." And sales of those familiar products – such as Betty Crocker Au Gratin Potatoes or Nestle Sno-Caps – have not tanked. Maybe a simple “bioengineered” band-aid on product labels can heal public perceptions. 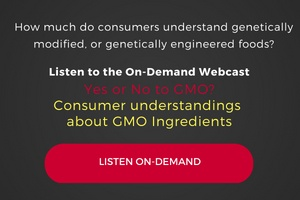 Do Consumers Really Understand GMOs?